Fourth and short for Denver. Broncos look like they'll go for it at the Patriots 32. Ninkovich thought he was held there. Big-time individual effort by Freeny gets the third-down sack. Pushes Broncos out of FG range. First run play for the Patriots. Tom Brady has been sacked 23 times this season, more than he got sacked all of last season (21). Kubiak really had 'em ready. Complete Clown Show by the Broncos in the first quarter. END OF 1ST: Patriots lead, 7-0. Of Patriots' 11 plays, Brady has dropped back to pass 10 times. Sacked once, one run by Blount. Talib flagged for personal foul, blocking Slater while out of bounds. 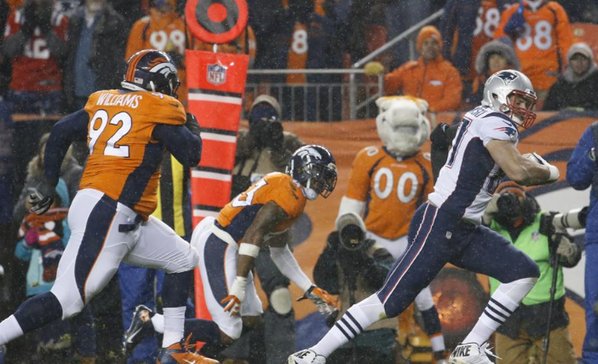 A little surprised the Patriots chose to punt on fourth-and-1, but Talib's penalty puts Broncos at 10. Field position game. First INT of Chandler Jones's career. 3rd TD of season for Chandler.